Happy Monday! Did anyone else feel like the weekend passed in a blur? The same could be said for summer in general. Sitting down and looking at the calendar my daughters will start school in less than one month! I love having my daughters home and really really am not looking forward to sending them to school all day, at least they have pretty terrific teachers this year. Boy how my garden grew while we were away from (thanks neighbors for watering and keeping it alive!) Here are a few snaps of my little garden. Something is eating my broccoli. I’m afraid I can’t grow coniferous vegetables. Link up in the comments if you have photos of your garden. 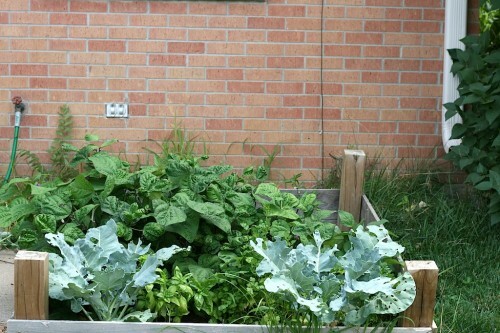 I love seeing what and how other people are growing their summer crops. 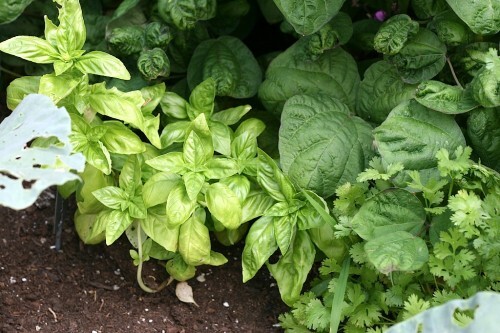 This year I am going to try some late season gardening by planting lettuce, spinach, chard, radishes, and scallions. 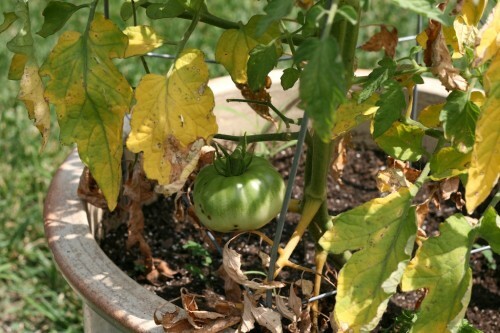 Have you done late season gardening before? What did you plant? Okay now on to the recipe! Here is the scenario: The kiddos are hungry and getting a little bit whiney, Alex doesn’t care what we have for dinner, and I have no clue what to make. How many times have you been in a similar situation? Sometimes when this happens I turn to Twitter. I like to hear what other people are fixing up for dinner as an inspiration. Generally speaking, I find out I am not the only one having a hard time coming up with what to fix for dinner. The inspiration for this dinner came from seeing the package of linguine noodles and jar of peanut butter sitting by each other in the pantry. Next I opened up the fridge and stared into theÂ abyssÂ for awhile (I know you totally do that too). My eyes landed on a package of chicken tenders and a jar of garlic chili sauce (from the makers of Sriracha). 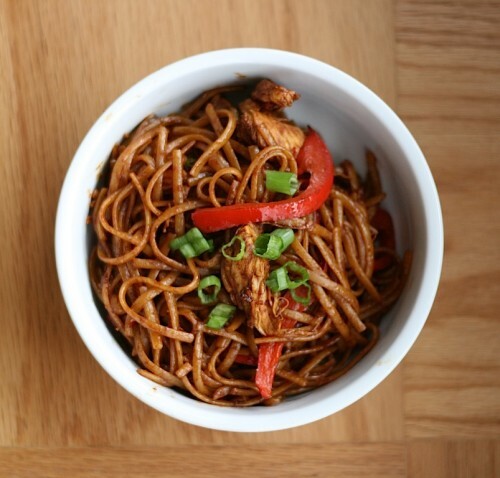 Hmmm spicy peanut butter noodles sounded good. I pulled open the produce crisper because I wanted some veggies in this dish too. There was a lone red pepper that needed to be used up and a fewÂ straggling scallions too. Into the dish it was going to go! So now you know the cast of characters. Cook time for this dish was about 15-20 minutes. Seriously! Since the first time I made this I have remade it at least twice. It is a dish I actually now crave. I hope you add it to your menu and give it a try. In a skillet heat the oil over medium heat. Cook the chicken tenders until no longer pink in the middle. About 3-4 minutes per side. Remove chicken to rest for 5 minutes. Slice thinly. Saute red pepper and 2 scallions for about 5 minutes or until red peppers begin to soften. You may need to add a little more oil to the sauce pan. While cooking chicken and vegetables cook noodles according to package instructions. Drain. 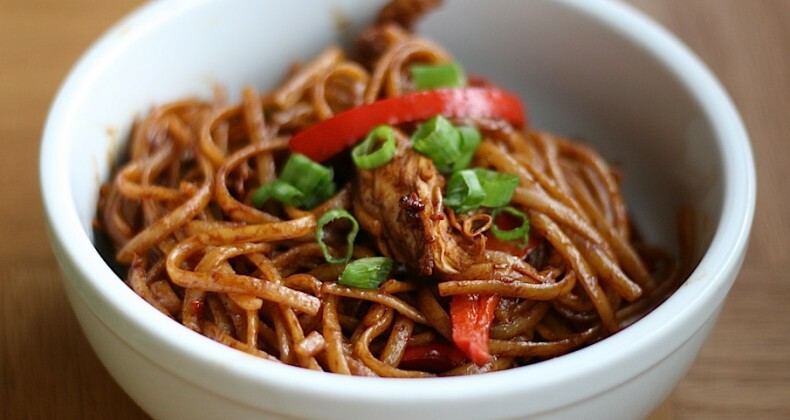 Combine noodles, chicken, peppers, and sauce. Stir to fully coat. Top each dish with a few raw scallion slices. 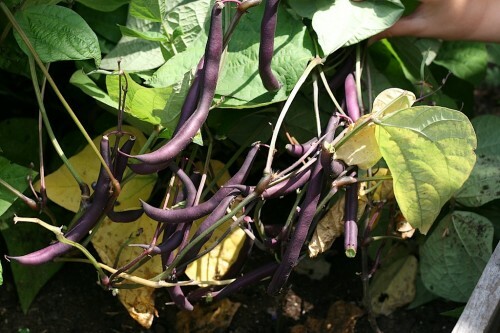 Your garden looks fabulous, those beans look yummy! Loving this recipe – we got to try it! I often fall in the “I dont know what to make” for dinner category and Matthew always says “I dont know either.” Then we take an hour to basically give options and none of us can still decide. By then I’m grumpy, sitting on the floor, throwing everything back into the cabinets and then go eat a chocolate bar. 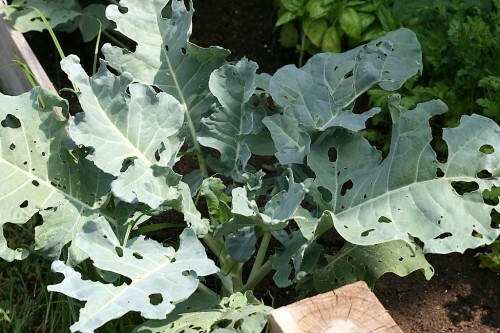 We had cabbage worms get into our broccoli and lettuce last year, did a lot of damage, much like yours looks. I used Sevin spray on the broccoli, it killed the worms and the broccoli had a chance to bounce back, we got a little harvest off of them. We didn’t bother with the lettuce, since it had a two week application-to-harvest wait time, and it would have been a waste. Depends how you feel about pesticides. That’s a great looking pasta!! 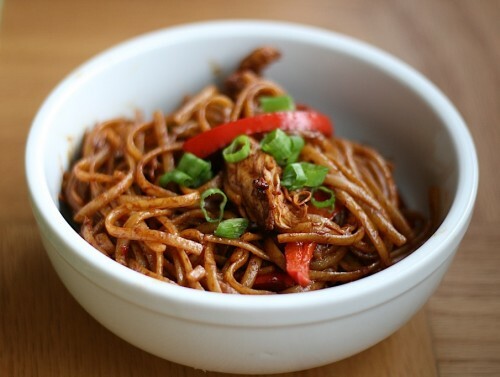 I love mixing spicy flavors with sweet…so peanut and spicy sauce is right up my alley. Will have to make this as a quick mid-week dinner! PS: I have an herb garden too but on my porch (we live in an apartment building) but it’s doing great. I want one like yours so much but I am making do with what I can for now.